LA Galaxy captain Robbie Keane underwent arthroscopic surgery on his right knee Thursday. The Irishman is expected to miss four to six weeks. 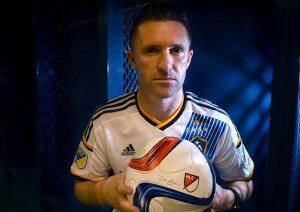 Despite news of another injury to another Galaxy designated player, Keane seemed to be in good spirits after the operation. He posted a photo on his Instagram account saying he was hopeful for a “speedy recovery” and vowing to come back “stronger” soon. The Galaxy have been hit hard with injuries in the early going of the season. Along with Keane, Giovani dos Santos (left quad injury), Steven Gerrard (left calf) and goalkeeper Dan Kennedy (groin) are all dealing with injuries. The Galaxy, without DP’s Keane and Gerrard, will take on the Whitecaps Saturday in Vancouver at BC Place, where Didier Drogba recently refused to play due to concerns over the artificial turf. The club is in third place of the Western Conference standings with six points. 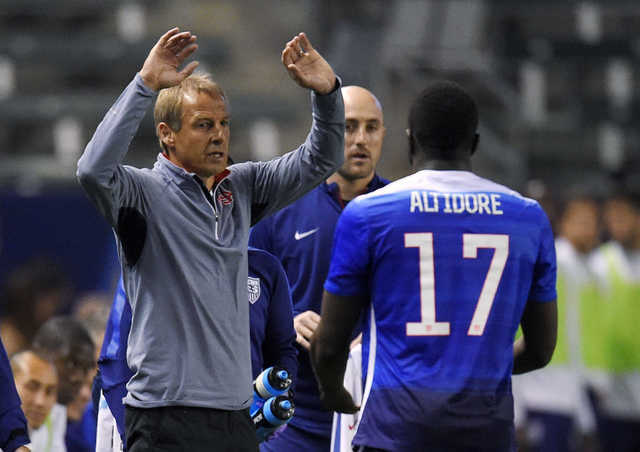 After failing to convert on a few of his early opportunity, Jozy Altidore was rewarded for his persistence when he put one past Canada’s Maxime Crepeau in the 89th minute. It was not a pretty game, but that goal was a thing of beauty though. You can read our full recap of the game here. This reaction — to getting surprised with tickets to Saturday’s sold out #USAvMEX game — is everything. Enjoy the game, and do try to avoid traffic. Plaza Mexico in Lynwood is the place to be this Saturday for El Super Clásico between Club America and Chivas. Whether you are a Club America or Chivas fan, or just looking to watch the game with a bunch of people, the Mexico City-themed shopping mall just of the 105 freeway is not a bad place to take in the game. The game starts at 3 p.m. and is being broadcast live on Univision (Ch. 34 in LA). Landon Donovan, the all-world, all-awesome, soon-to-be dad, went back to school and spoke at the University of Redlands Tuesday night. The former USMNT and LA Galaxy man touched on everything from what he’s been up-to since he retired to what it was like growing up in Redlands. The usually candid Donovan didn’t mince words when asked about not being a part of last year’s World Cup team. if you’re more of a visual person, check-out the photos. 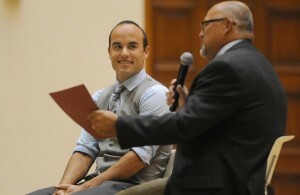 had a chance to hear @landondonovan speak tonight. It was very inspiring and something I'll never forget. So happy I was able to see @landondonovan at U of R tonight! It was a pleasure hearing you speak! Ex-Fire, ex-Red Bulls coach Juan Carlos Osorio could be Mexico’s new head coach, according ESPN Deportes John Sutcliffe. The Colombian-born Osorio, 53, was named head coach of Brazil’s São Paulo in May. He was previously at Colombia’s Atletio Nacional, where he guided the club to three league titles and two Copa Libertadores appearances from 2012-15. Mexico, under the guidance of interim head coach Ricardo “Tuca” Ferreti, takes on the USMNT at the Rose Bowl on Saturday, Oct. 10, with a ticket to next year’s FIFA Confederations Cup on the line. Tickets for that game are on high-demand. 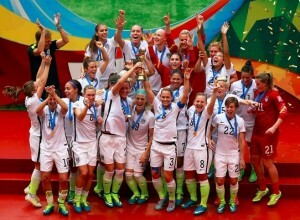 The entire 2015 Women’s World Cup champion U.S. Women’s soccer team will be together for a free, public championship celebration at L.A. Live’s Microsoft Square in Downtown L.A.. tomorrow, Tuesday, July 7, at 11 a.m. Fans are invited to attend the celebration and meet the members of the team that captured the United States’ record third World Cup title and first Women’s World Cup since 1999. And set TV ratings records. Parking is free and fans are encouraged to RSVP for the free event here. Is Steven Gerrard more approachable than David Beckham? Steven Gerrard is making a great first impression on teammates, fans and staff. The 35-year-old Englishman will naturally draw lots of comparisons with David Beckham, the Galaxy’s first Designated Player who helped the club win two MLS Cup titles and is also from England. 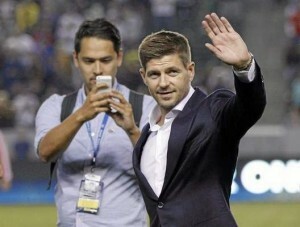 So, it’s no surprise that some at StubHub Center on Saturday were comparing Gerrard to Beckham, even pointing out that Gerrard “is more approachable” than Beckham. They are not the only ones who feel this way, the paparazzi would agree. That is not to say Beckham was not approachable, or nice. It probably means people were more in awestruck or intimidated by his star-power more than anything else. After all, Beckham was an almost mythological figure who everyone had heard or read about. It could also mean that the club learned from its mistakes with Beckham. Club president Chris Klein, who played with Beckham, also provided an upbeat report of Gerrard’s first week with the Galaxy to this publication. And just as important, everyone got to meet him. This is how you become an overnight sensation. 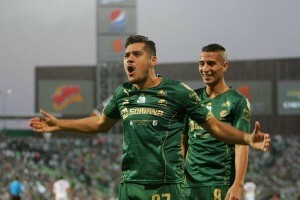 Javier “Chuletita” Orozco scored four goals for Club Santos Laguna Thursday night in the first leg of the Liga MX finals. Orozco, who had bagged a hat-trick by halftime, led los guerreros past Queretaro 5-0 at home. Here are all of the game’s goals and highlights. The hat-trick came in the 33rd minute.. There is still another game to be played, Sunday at 6:30 p.m. at Queretaro’s home stadium. But is this one over or can Queretaro come back? Ronaldinho is a football icon. He’s appeared in Nike commercials, graced the cover of FIFA video games, won the World Cup and has been named FIFA Player of the Year twice. But that means nada to Queretaro head coach Victor Manuel Vucetich. Ronaldinho, 35, has been playing for Querataro the past two seasons. Vucetich joined the club midway through this season and lead Los Gallos Blancos to their first Liga MX finals in club history. The former Barcelona man should be a hero in the small state for leading the team to such heights, but he is not. Ronaldinho, easily the most recognizable name in Mexico’s finals this wek, may not even play Thursday in the first leg of the series against Santos Laguna (6:30 p.m., Azteca America). That’s because Ronaldinho’s tumultuous time in Mexico hit a boiling point last week during the first leg of the semifinals. After being subbed out just before halftime, Ronaldinho left the stadium before the game was over. He apologized to the club and its fans the next day. Vucetich, who is in his seventh Liga MX finals, was right. With Ronaldinho on the bench, Queretaro went on to win the second leg 2-0 to advance to the finals. The series-winning goal was scored by former Chivas USA defender Jonathan Bornstein’s in the second half. Nicknamed King Midas for taking struggling clubs and turning them into champions, leading Queretaro to the finals could be Vucetich’s best job as a coach to date. 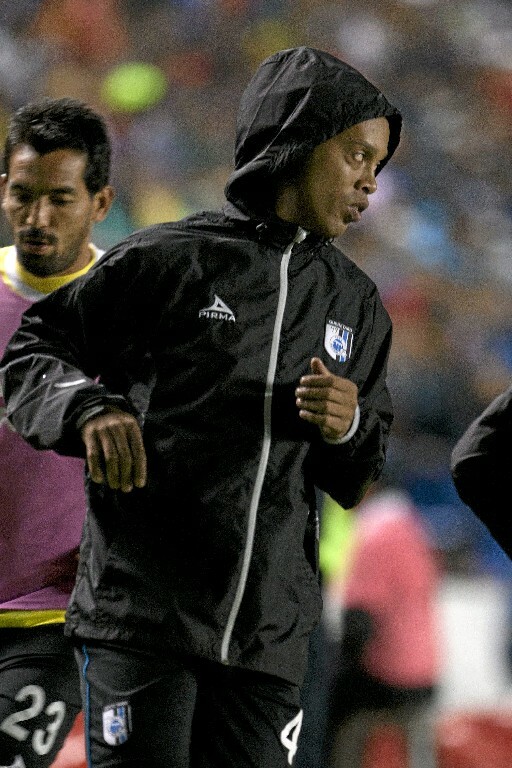 Reports in Mexico indicate Ronaldinho’s time with Queretaro is over and that player and club have agreed to go their separate ways at the end of the season. He did travel with to Torreon, but most soccer pundits south of the border find it unlikely that the two-time player of the year starts tonight’s game. However the guessing continues: Will he start on the bench or on field? – The final features the sixth seed against the eight seed in la liguilla. Santos was the eight seed; Queretaro the sixth. – Other notable players (not named Ronaldinho) in the finals: Bornstein, Ricardo Osorio and Sinha for Queretaro; Goalkeeper Agustin Marchesin, Carlos Isquierdoz and Javier Orozco for Santos. – The coaches: Santos’ Pedro Caixinha of Portugal is in his first final with Santos after reaching losing in the semifinals three times; Vucetich, a former head coach of Mexico’s national team, is in his seventh final and has only lost once before, to Santos in 2012. – If you don’t speak Spanish but want to keep up with the final, follow Santos’ English-language twitter account @ClubSantosEn, which is managed by an American living in Mexico. – Second leg of finals is Sunday in Queretaro at 6:30 p.m. on Azteca America.